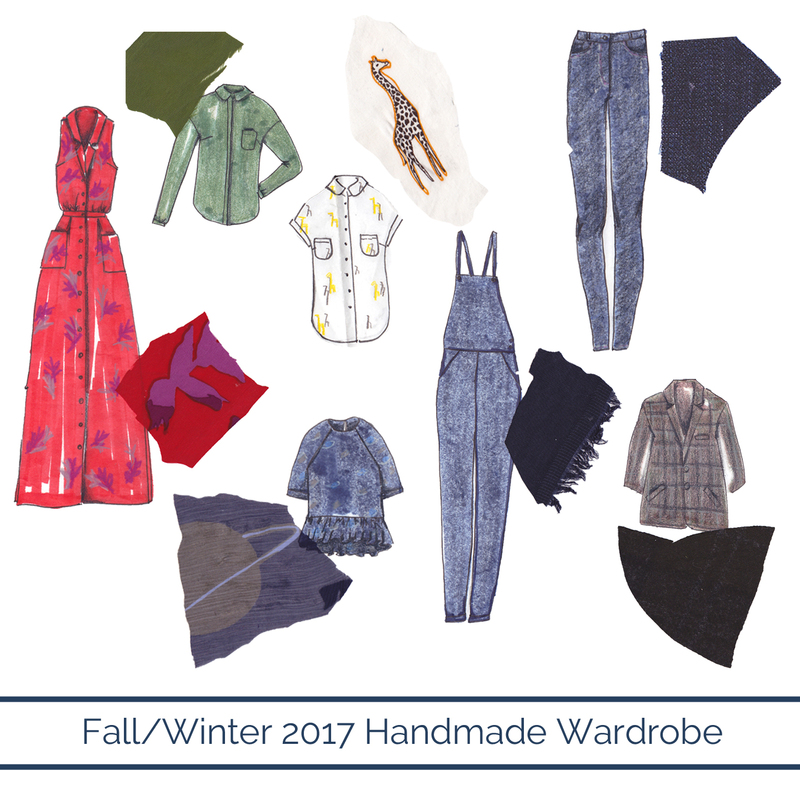 I’ve finally narrowed down my makes for 2017 and today I’m excited to share with you my spring/summer collection. I decided one pattern a month is a good goal to aim for. Did you catch that? 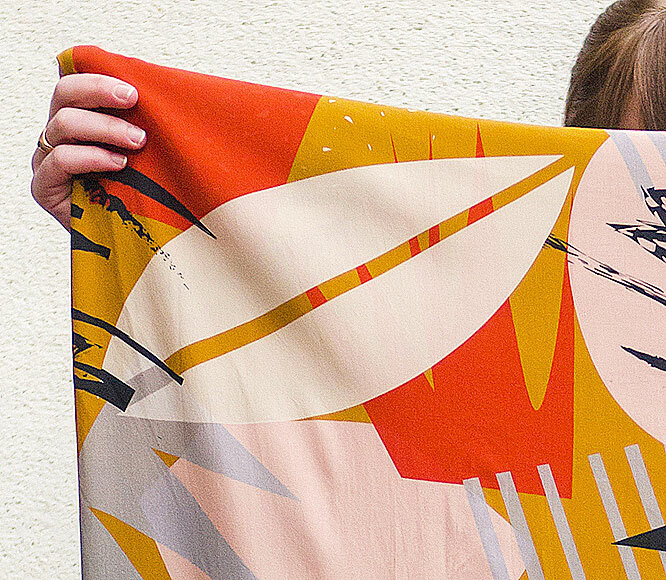 I said one pattern a month… not one project a month. Cheating? Maybe. But this year I’d really love to stock up on some everyday separates in my handmade wardrobe, so I thought I’d try to squeeze out some multiples in a few of the months. Will this actually happen? We shall see, but a girl can dream can’t she!? Once I narrow down my pics I like to sketch them all out on a giant piece of paper and post it up in my studio to help me stay on track. 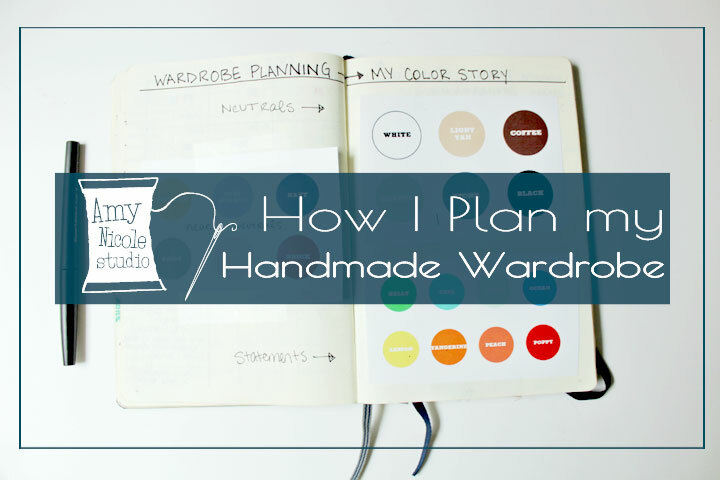 If you’d like to see more about my planning process and how I got to this point check out this post. (Spoiler alert: I use my bullet journal!) Without further delay… lets break it down shall we? In the past few years I’ve been slowly getting more and more intentional with planning my me-made wardrobe. 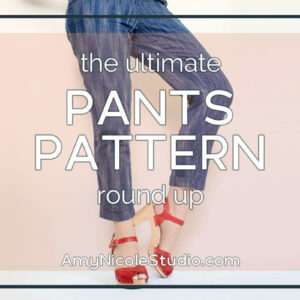 A couple years ago I went through the whole wardrobe architect process to really hone in on my style, look at what gets worn the most & least out of my wardrobe, and gather inspiration in Pinterest. This past year I discovered bullet journaling. (Which you can learn more about here) I love my bujo (bullet journal) because I’m an avid planner, and the layouts in pre-made planners were never quite right for my needs. With the bullet journal I can customize to my hearts content. 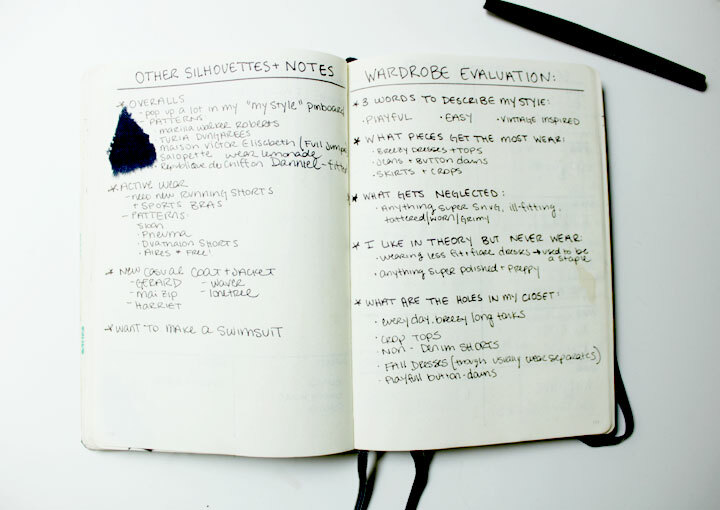 So when planning my 2017 makes I decided to review my wardrobe architect process and create layouts in my Bujo specifically for wardrobe planning. 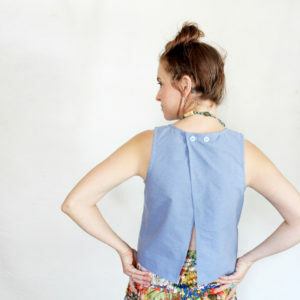 My goal is to sew one pattern a month (some patterns I will be making multiples of). Along side my “day job” running the restaurant with my hubs plus my many side projects I think this is a reasonable number in order to not be overwhelmed. 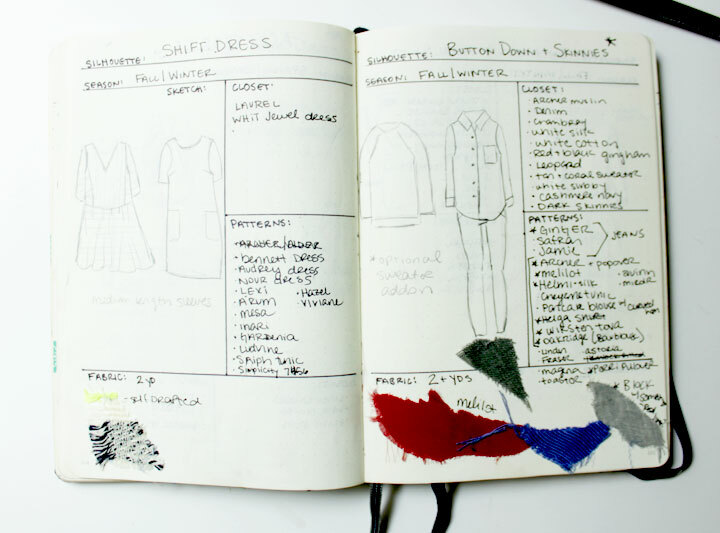 Plus putting a specific number on how much I’m going to make forces me to be more strategic and mindful about what I choose to make instead of trying to sew all the things that I won’t necessarily wear day to day. 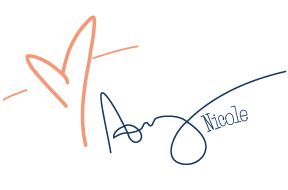 Ideally I will be able to squeeze in other personal projects such as refashions or home DIYs along side the set pattern for each month, but life happens so I’m not going to pressure myself about it. 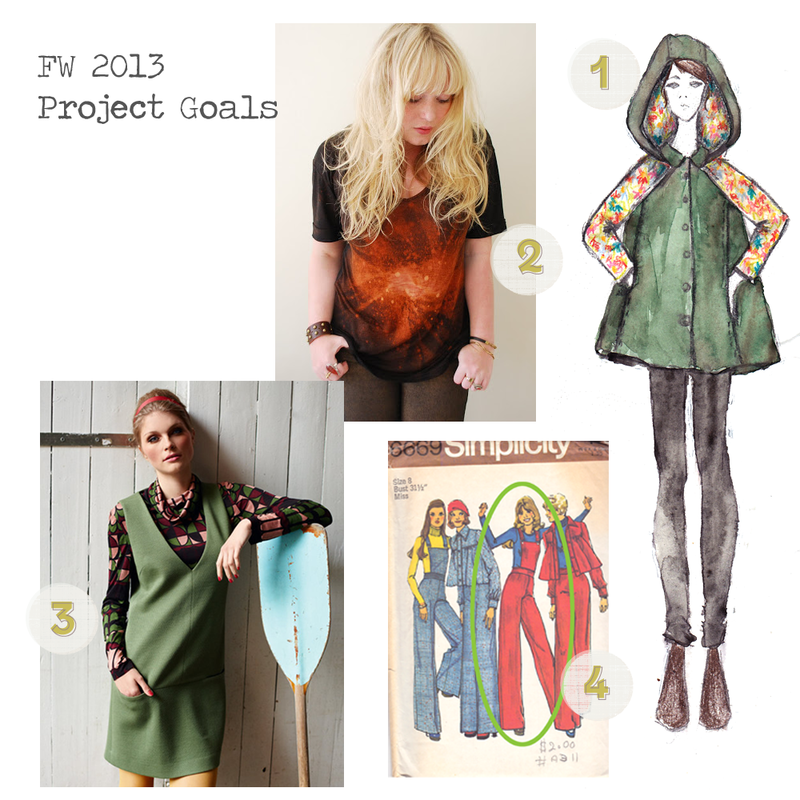 I chose 5 silhouettes each for fall/winter and spring/summer based on the wardrobe architect method. Then I made a spread for each silhouette. 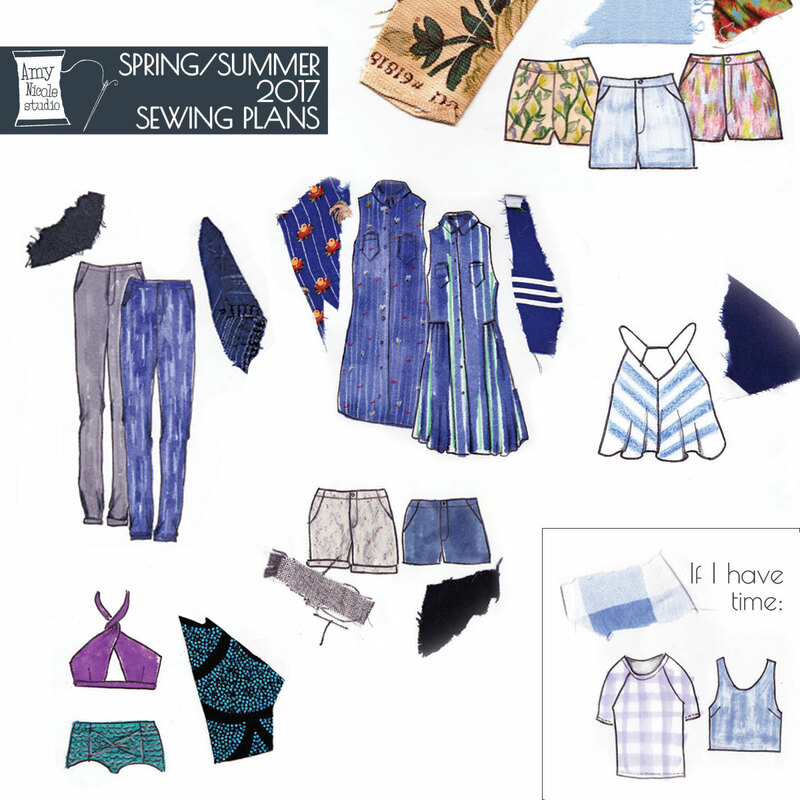 Spreads include the name of the silhouette, corresponding season, a space for a sample sketch, another for fabric swatches, and spaces for cataloging both items I have in my closet and patterns I have my eye on that fit said silhouette. Then came the hard part: choosing. 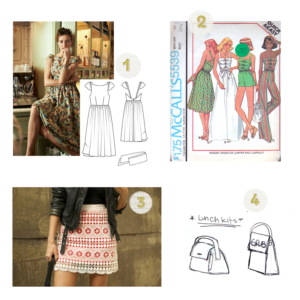 Just 12 patterns – 6 for spring/summer, 6 for fall/winter. (Considering the Texas weather). I’m still actually working on completely narrowing it down, but I have several ideas penciled in. I blocked out a page with a space for each month, considered the weather and when I would like to have certain pieces done by, and started making cuts & filling in projects. Y’all… this was SO HARD. So many times I caught myself trying to squeeze in an extra project each month. 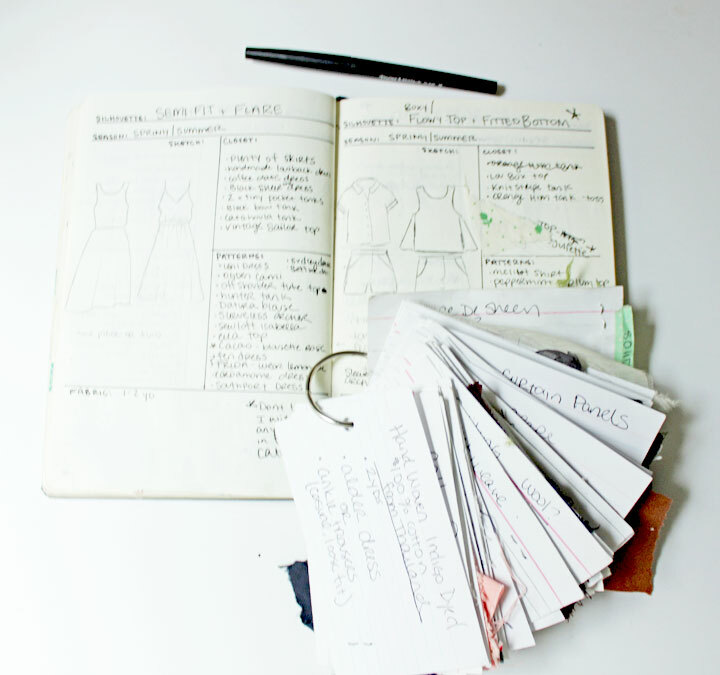 But I just kept going back to the process, visualizing my wardrobe as a whole and how everything would fit together. Stay tuned for the final reveal of my 2017 me-made capsule. 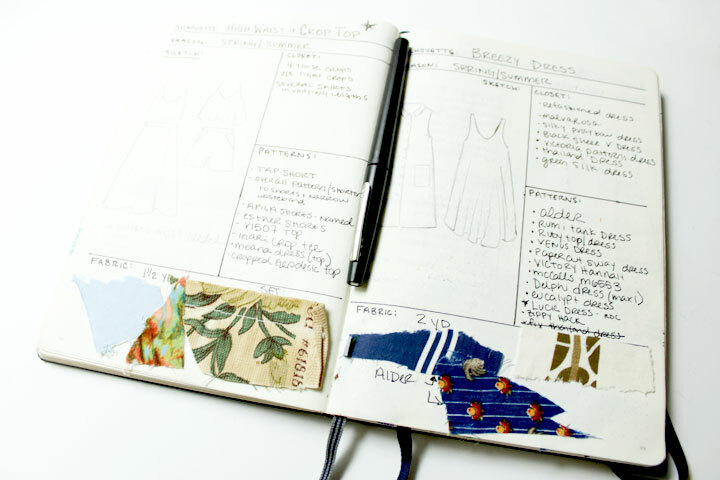 Do you use a Bujo for your sewing planning? I’d love to see your spread! Me-made planners not your thing? 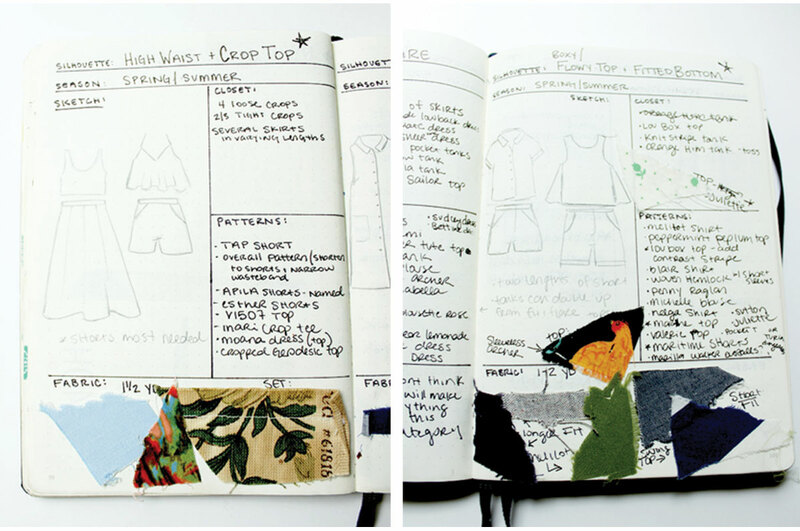 Colette Patterns just released the most beautiful sewing planner this year. Use something else? I’d love to hear about it! Whoopie! I have been so anxious to get this done and get it out to you guys and I can’t tell you how excited I am that its finally happening! 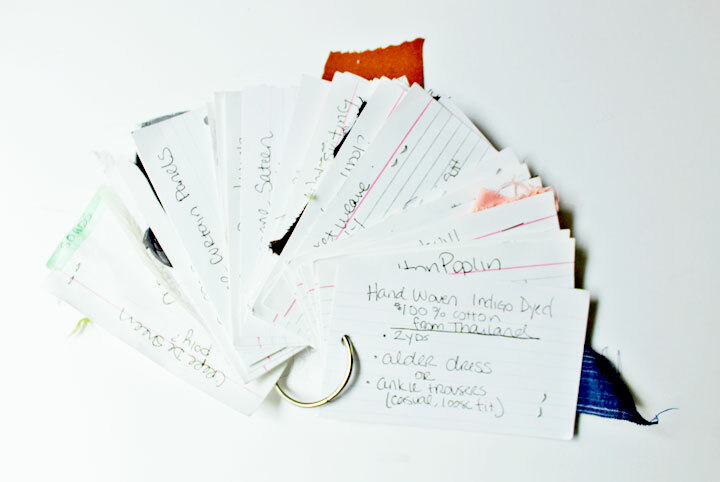 I dont know if you know this about me yet, but I am an avid list maker. I make lists & charts any chance I get – literally. Its just the way my brain works, I like to be organized! 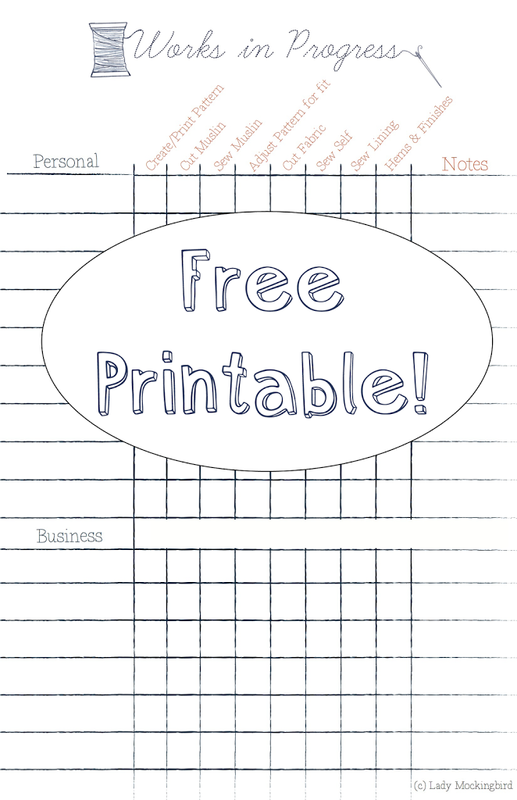 So, today I have for you a FREE printable of my super duper work in progress tracking sheet for all you other scatter-brained multi-project-starting sewers out there! I used to keep this chart on my computer, but then I decided I’d use it more often if I print it out and put it on the wall. It has plenty of spaces to write each of your current projects in progress, and the different “checkpoints” are listed across the top so you now what state each of those projects is in. 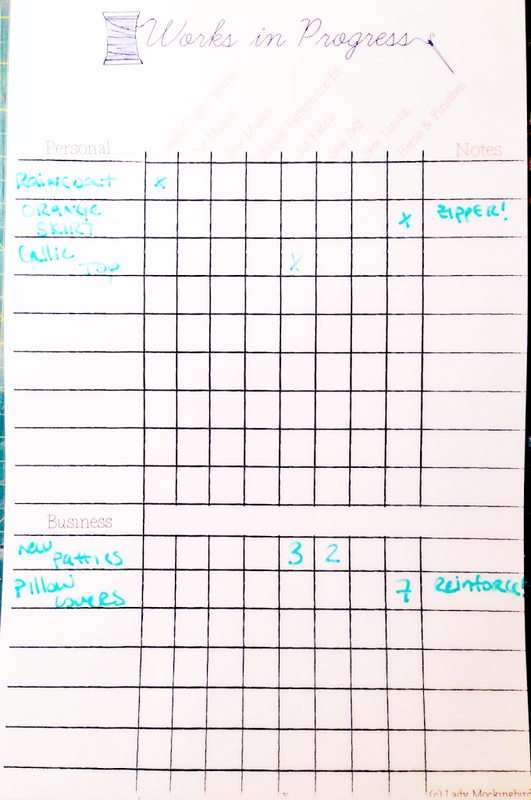 I got mine laminated and use dry erase markers to easily make changes and track my progress, but you can just as well print it on paper and refresh with a new one when it gets full! There are two versions: a larger 11×17 that has a section for business at the bottom for those of us who sew for business and pleasure, and a regular 8 1/2 x 10 that only has one section for personal sewing. 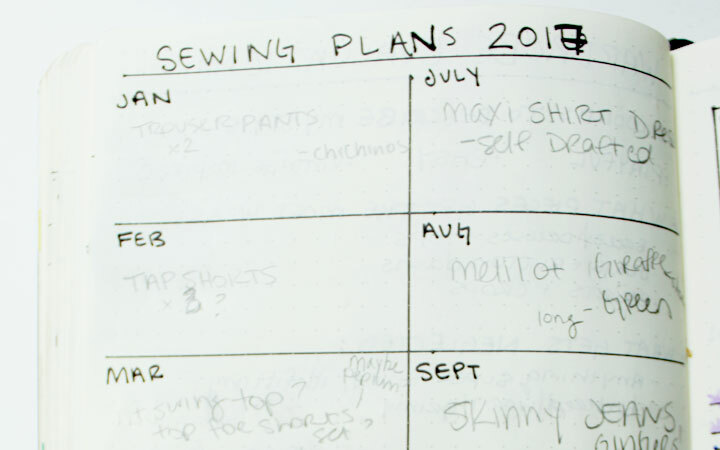 I put an “x” to mark where I left off for my personal projects, and for my business projects – where I’m often sewing multiples, I put the quantity of items left off in each step. I’d love to know how you use your charts – share in the comments below! I’m really excited to get started on this raincoat, It’s been on my mind for a long while now. I just hope I don’t have too difficult a time finding fabric! I have a shirt all ready to go for the galaxy T – it’s well-loved and desperately needs updating. The Burda Jumper I think I will do in black, which I already have fabric for – just love ticking away at my stash! As far as the overalls go I’m really not sure what direction I want to go fabric-wise … I’m super open to suggestions! 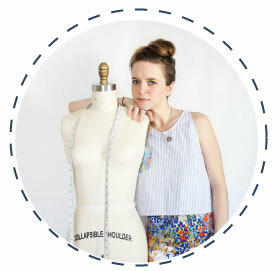 Have any exciting sewing plans on the horizon? – Please share! As the temperature slowly creeps up (finally) and the sun decides to grace us with it’s presence a little more often every week, I can’t help but get excited for summer. So, with a little extra time on my hands lately I’ve been day-dreaming brainstorming about projects I’d like to accomplish for & during the spring and summer season. Notice I said like to accomplish…. in order not to stress myself out thinking these are things I need to accomplish, I’ve named this my “Like to Sew for Summer” list. I’ve been trying not to think of all of the projects I have my eye on (pinterest, burdastyle favorites, fabric stash, refashions, etc.) 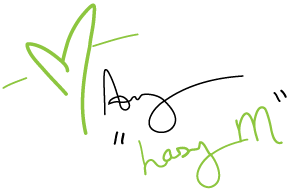 as a chronological order to-do list and more like a giant pool of options – it seems much less stressful that way don’t you think? So, I’ve decided that at the start of every season I will go through my pins, fabrics, favorites, sketches, pattern stash, you-name-it and pick a few things that I’d like to try and tackle. I think it will be a fun way to review my “idea stock” on a regular basis as well as keep my projects season-appropriate. 1. This dress from burdastyle is so amazing, I fell in love the first time I saw it.. and I have just the fabric in mind. 2. I bought this pattern at a street sale last summer and have had it on my mind ever since.. I’ll be doing the romper version, I think in a chambray – thoughts?? 3. I’ve had some lace laying around my stash for YEARS.. saw this skirt on pinterest and now I finally know what to do with it! 4. I’ve gone through so many paper handle bags as lunch bags.. I’m ready for something sturdy I can re-use. These are some sketches I had of ideas. I’ll probably be posting a tutorial/pattern once I work this one out so stay tuned!! Now, knowing me I’ll also be squeezing in various alterations and possibly some simple re-fashions as time permits, but this is a nice solid starting off point I think. 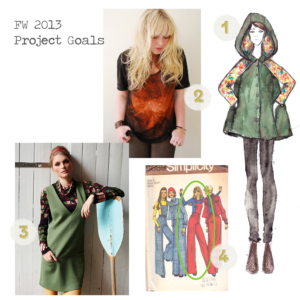 Do you have your eye on any projects for summer? Done a project like any of these before?… I’d love to hear about it in the comments below! 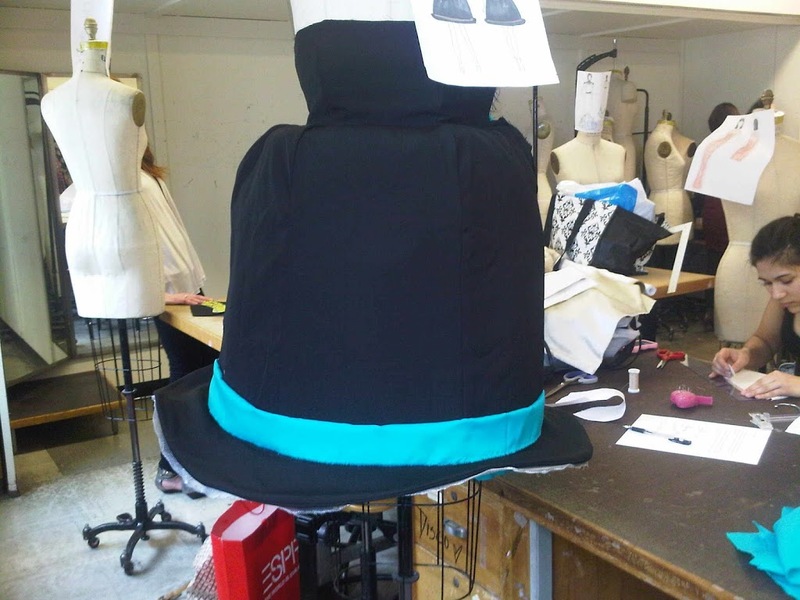 Remember the Hat Dress? Well it’s coming along quite nicely. After a few hiccups and break-downs (didn’t fit the form, weird ripples here and there, things collapsing..the usual) I’m at a point where I’m pretty pleased with it. It’s not quite finished, and it’s definitely not perfect. 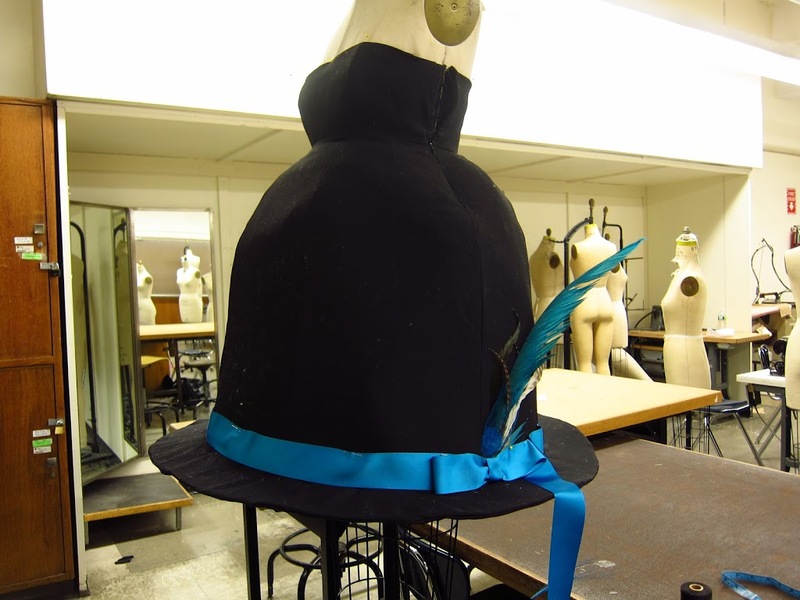 But considering the fact that it’s a dress shaped like a hat (and who ever makes those! ), I’m giving myself a pat on the back in spite of it’s uneven-ness and subtle ripples. I have to have it finished by friday and it’s officially due next tuesday. I’m feeling pretty confident time-wise, although its become quite cumbersome and barely fits through the doorframe of my room! I’m hoping it can make the last few trips up to school that it needs to in one piece! For the brim I used a layer of metal screen (like for a window) over a layer of buckram. The threads you see around the edge are holding in place a strip of millinery wire that I put around the edge to keep it from flopping around. Ribbon and bow pinned in place. I still need to stitch those down. She looks pretty cute doesn’t she!? 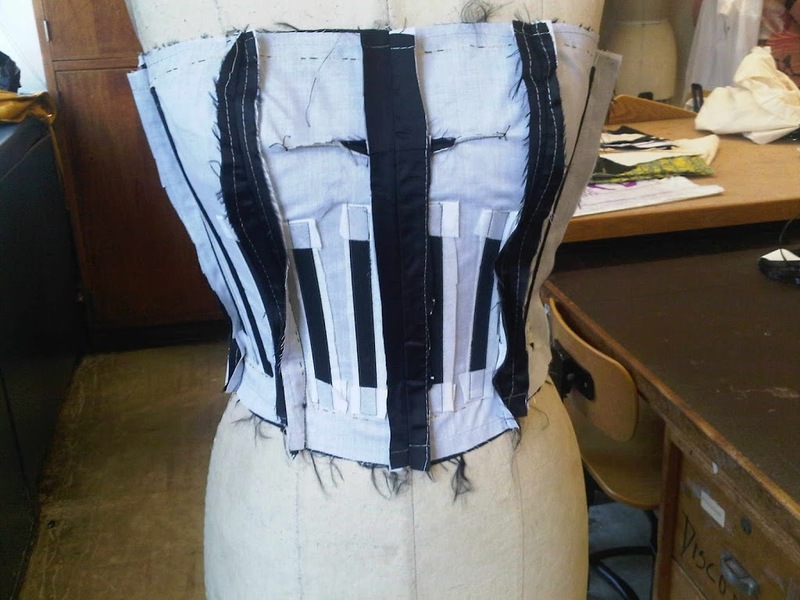 Added boning around the top curve, bottom curve and zipper seam to help hold the shape. 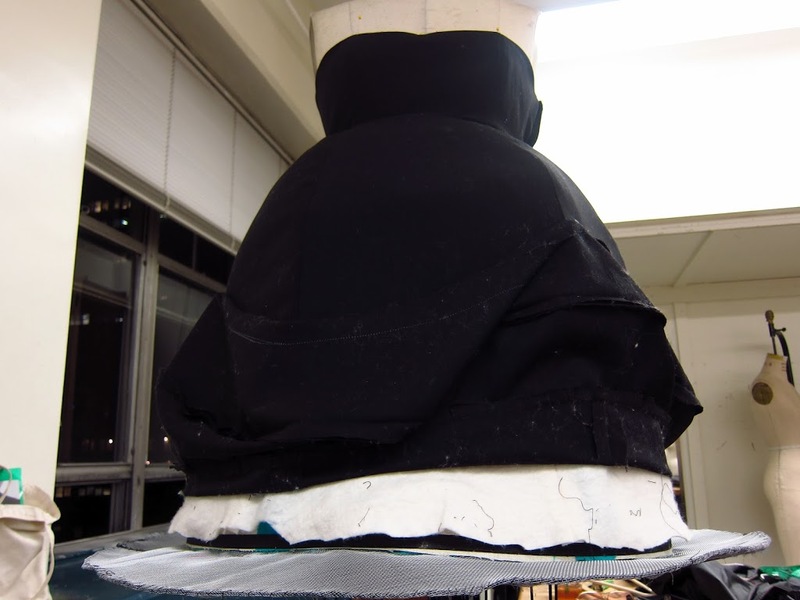 Lessened the depth of the curves in the gores for a smoother look – in my last update the fabric wasn’t laying right. Now all she needs is a tacked down ribbon and a few thousand rolls of a lint roller. I’d love to hear your questions/feedback! Email me or leave them in the comments below! Been busy working on a very intricate term garment for school and my lovely Gentleman suggested it might be something fun to share with my readers… boy he’s a smarty! So our inspiration is Elsa Schiaparelli & surrealism. I love Schiaparelli because she is so quirky and fearless with her designs, while still keeping it elegant. My dress is specifically inspired by Rene Magritte, a surrealist painter whom I’ve admired for a long time. He is most famous for his pipe painting and man-in-the-bowler-hat paintings. 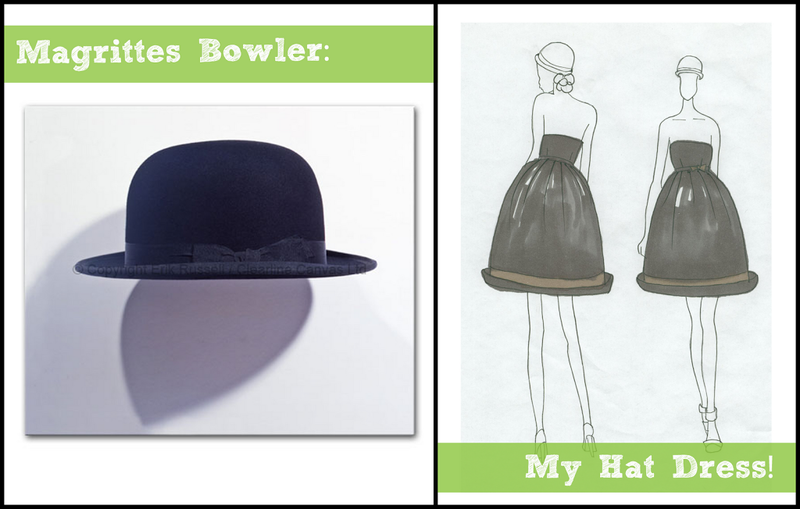 In the interest of fun and trying something different, I decided to make a hat dress! There have been a few changes to the design since this sketch. 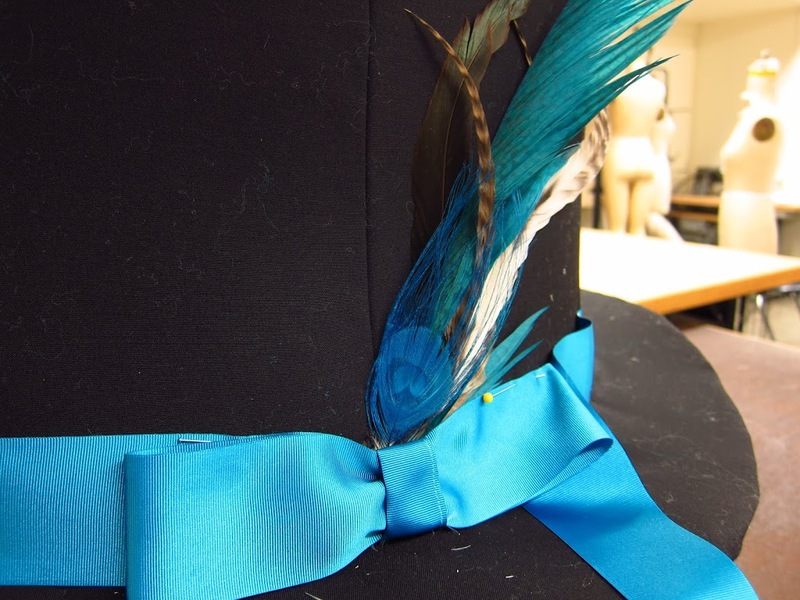 The band will be teal and I’m adding a bow like the one on the hat picture and some feathers as well to bring some more Schiaparelli into the picture. I was a little nervous because I’ve never made anything with structure like this before and have just recently learned to work with boning. 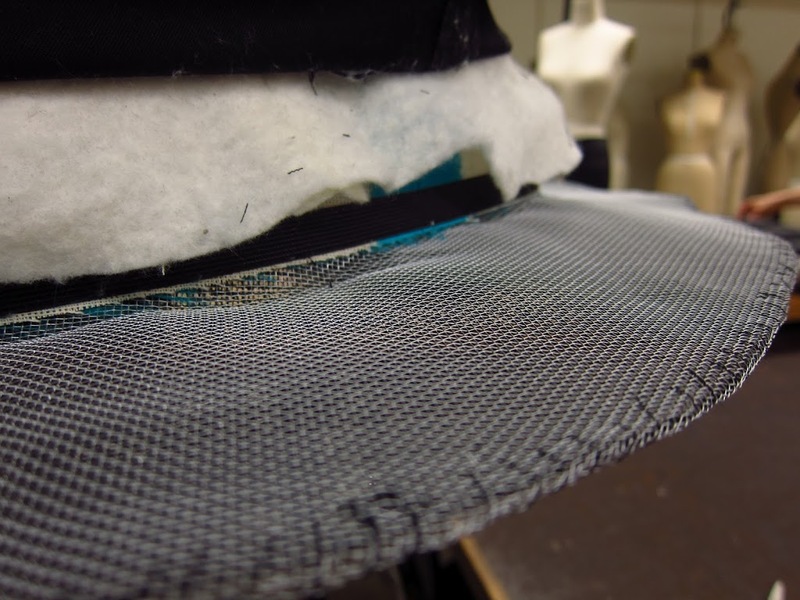 I was lucky enough to find some very stiff interfacing in the garment district (how lucky I am to live in New York!) that actually holds the shape quite well. 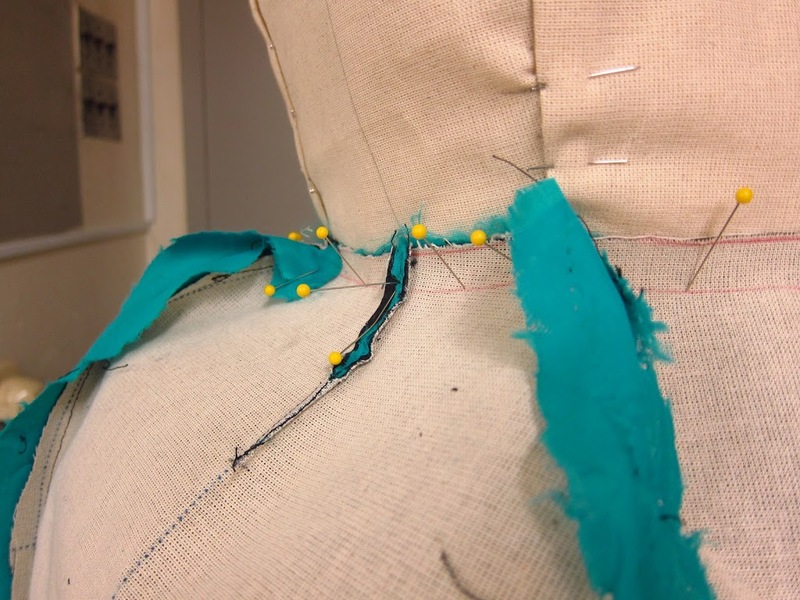 The biggest challenge while working has been handling the stiff interfacing – it was bending all my pins! Here’s the under layer… holding shape all on it’s own. Aside from curved gores, I also put darts on the side panels to add to the shape. 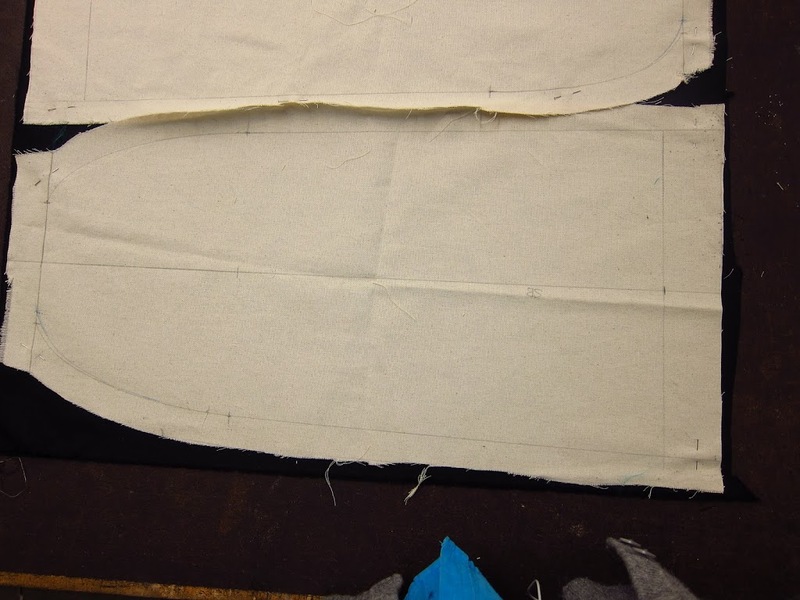 A look at the shape of my pattern pieces. 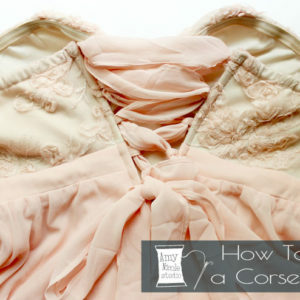 A french lining with boning will hopefully help this dress to stay up on its own. 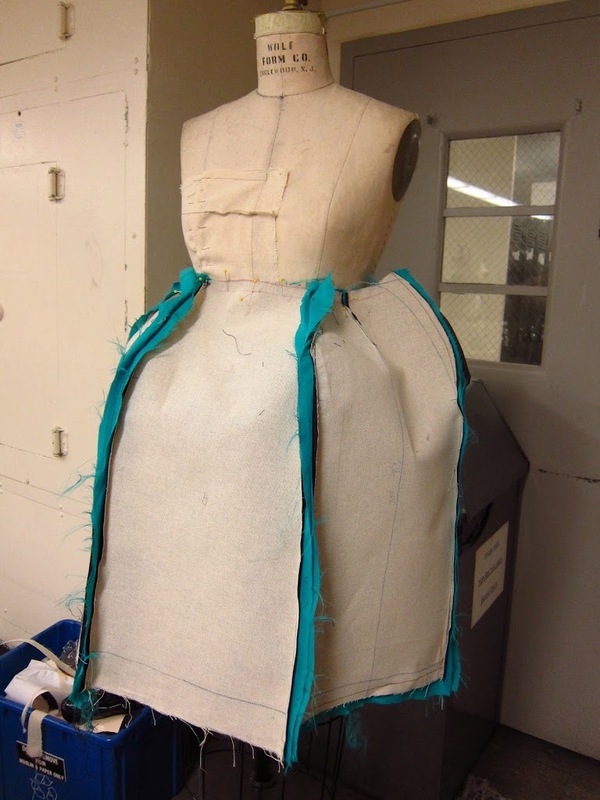 Here’s a rough fitting I did with the top layer of fabric. 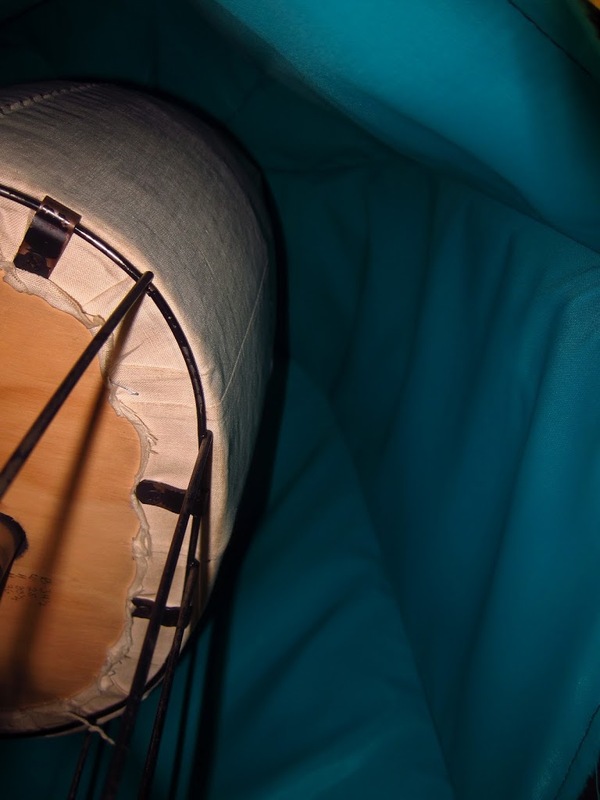 The curves need to be smoothed out – they are a little too deep. Also, I used a wire mesh (like for a window screen) for the hat brim. Right now there is only one layer but I’m thinking I will use two to keep it more stable. I also might put a piece of oaktag in between the layers to keep it from looking so wavy. Once it’s finished I will add the teal band with a bow and feathers on the side! What do you think? Any suggestions on materials that would work better for the brim? I have about three weeks left to finish which I am feeling pretty good about but I also don’t want to get too confident and then be scrambling for time – that’s when I make all my mistakes!